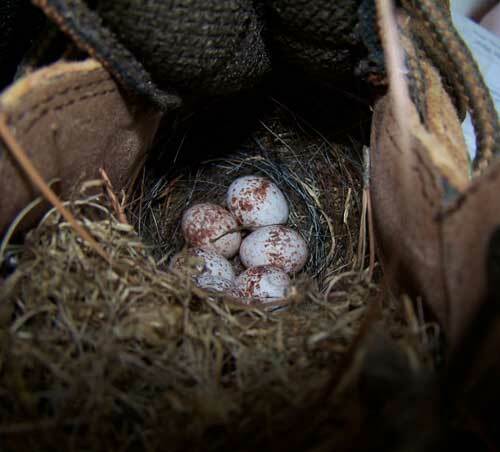 A Carolina Wren nest in a boot. Carolina Wren's often choose odd locations for their nests. 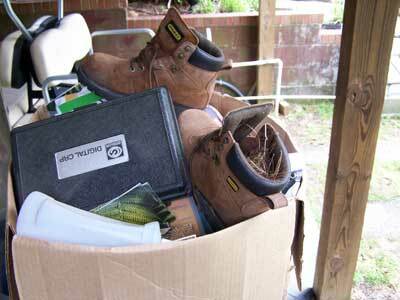 They do not often chose to use nestboxes. A Carolina Wren nest is a bulky, somewhat messy mass of debris like leaves with some coarse hay/grass, twigs, moss, little roots, weed stalks; strips of bark, plastic or even snakeskin; generally domed with tunnel like entrance; and lined with feathers, animal hair, Spanish moss, wool, and fine grasses. Eggs are white/pale pink or rosy tint/light gray (larger than other wren eggs); usually with heavy brown/reddish-brown flecks often concentrated at larger end. Little or no gloss, unlike House Wren. From Bent's Life Histories of Familiar North American Birds: "Nests of the more domestically inclined wrens have been reported in a great variety of nooks and crannies in, about, or under buildings of various kinds, under bridges, or in holes in fence posts. Almost any kind of receptacles left lying around, such as tin cans, coffee pots, pails, small baskets, pitchers, or empty boxes may be used. Old discarded hats and caps or the pockets of old clothes, coats, or overalls, left hanging in sheds or on porches, may offer acceptable nesting sites. Nests have been found in mail boxes, bird boxes, old hornets' nests, and ivy vines growing over porches; and the nest is sometimes built in an unused cupboard or on a mantel shelf inside a house." Others report nests in flower pots, a leaf blower, on top of propane tanks, the mounting bracket for a satellite dish, around a push lawnmower blade, inbetween folded seat cushions, and a cardboard box. From Bent: Dr. Witmer Stone (1911) writes: "In a country place near Philadelphia, a pair of Carolina Wrens entered the sitting-room through a window that was left partly open, and built their nest in the back of an upholstered sofa, entering where a hole had been torn in the back. Needless to say, they were not disturbed, and given full possession until the young were safely reared." Mr. Vaiden tells of a pair of these wrens that raised a brood of young "in the pitcher of a pitcher-pump," left in the basement of a house. "The parents came through the partly opened basement window and gave little attention to the humans that had to occasionally go into the basement." 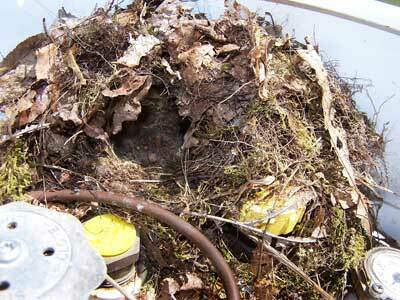 This Carolina Wren nest was in CT, on the top of a propane tank (under the cover). The babies have already fledged. Lots of moss and dry leaves. Photo by Bet Zimmerman. 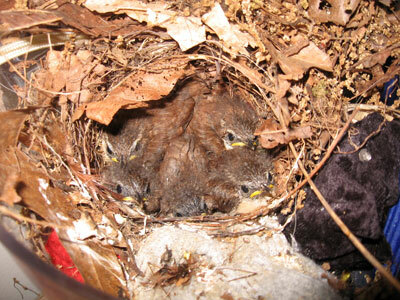 Several people report that, unlike bluebirds, Carolina Wrens often do not nest again in the same place even when successful. Carolina Wren sitting on a nest built inside the cover of an old ceiling light fixture. Photo by Jana Fuhrman Deeks of North Texas. 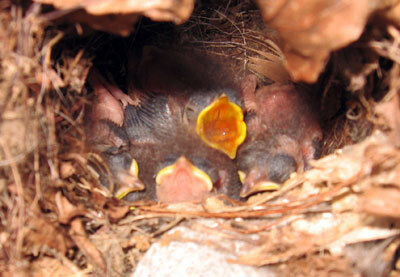 Two day old Carolina Wren nestling from the light fixture nest above. Photo by Jana Fuhrman Deeks of North Texas. Notice cellophane in nest. Birds sometimes use this in lieu of snakeskin. The egg in the front looks different for some reason. Unfortunately this nesting failed. Earlier, several eggs were found about 12 feet away on the ground. Jana returned the one uncracked egg to the nest, which still had three eggs inside it. One of the eggs hatched. Several days later, there was only one egg in the nest, no baby, and the nest appeared undisturbed, but was obviously pretty accessible to predators. 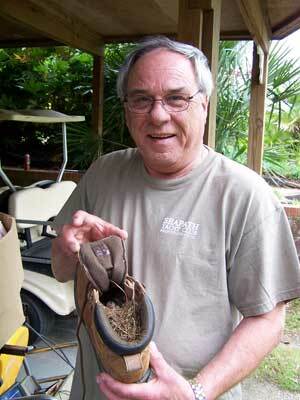 See Predator and Problem ID and Solutions. Carolina Wren Young. Photo by Karen Ouimet. These babies are 4 days old. Five out of six eggs hatched. The nest is in Karen's bathroom. 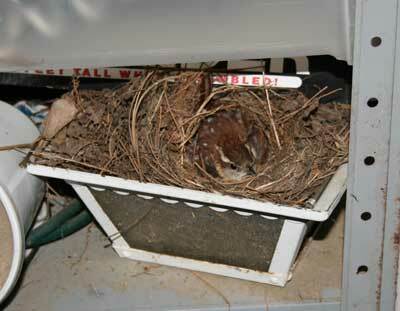 She left the window open one day, and the wren made a nest in a container she uses for hair scrunchies. She decided to leave the window open for a month to accommodate them. The nest was completed in 3 days. The babies hatched 14 days after incubation began. 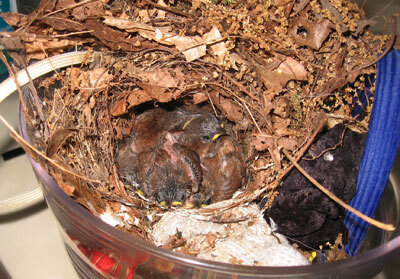 Carolina Wrens in bathroom, 10 days old. Photo by Karen Ouimet. 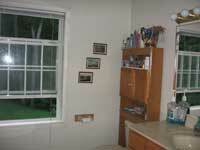 The nest is in the glass container on top of the cabinet to the right of the window, below. The bathroom babies are 12 days old. Photo by Karen Ouimet. Human visitors feel pressured to get in and out because both Carolina Wren parents scream and dive bomb them when they come in to use the facilities. 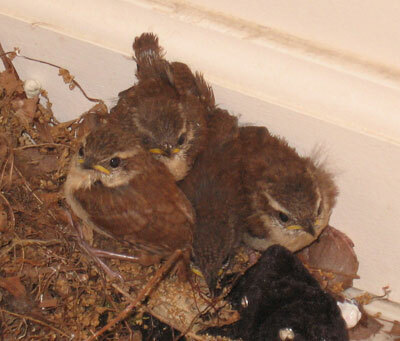 The babies fledged on day 13, unprovoked, but could only fly about knee high, and landed on the floor. Karen managed to herd the back into the bathroom and put the nest on the floor and closed the door. The next morning they were huddled in the nesting material, but had decorated the entire bathroom with poop. The parents were still feeding them. 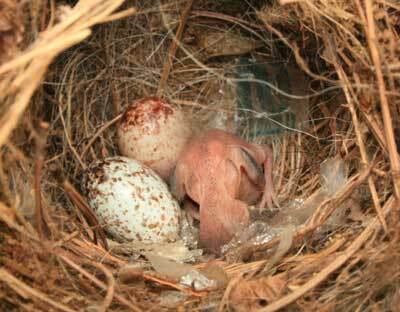 Unfortunately, one of the nestlings was found dead later that morning, perhaps from a crash landing. The parents continued to feed them and two days later were able to fly chest high, but were still in the bathroom. 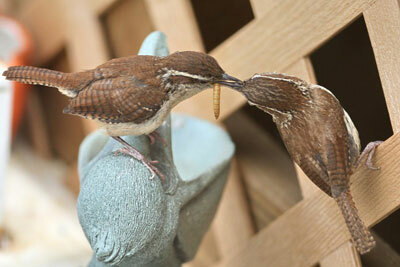 An adult Carolina Wren feeds a fledgling (on the right.) Photo by Dave Kinneer. Unlike House Wrens, Carolina Wrens co-exist well with other cavity nesters. The Carolina Wren likes to nest where she " can dodge in and out and in a twinkling appear or disappear like a feathered Jack-in-the-box"